Colleen Sheppard is Professor of Law at the Faculty of Law, McGill University. She recently completed a term as Director of the McGill Centre for Human Rights and Legal Pluralism. She has an honours B.A. and LL.B. from the University of Toronto, an LL.M. from Harvard University and is a member of the Law Society of Upper Canada. Her teaching and research focus on systemic discrimination, equality rights, mental health in the workplace, Canadian and comparative constitutional law and feminist legal theory. 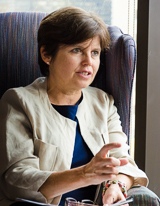 A former law clerk to Chief Justice Brian Dickson, she has also been a visiting professor at Dalhousie Law School, the University of Maine School of Law, and the Institute of Comparative Law, Université Lyon III. In addition to her teaching and research, she has been active in public interest work. She served as a Commissioner on the Quebec Human Rights and Youth Rights Commission from 1991-1996 and has worked with the federal Department of Justice, the National Judicial Institute, the Canadian Human Rights Commission, the Truth and Reconciliation Commission of Canada, the Ontario Métis Aboriginal Association and the International Labour Organization. She was also on the Board of Directors of Equitas – International Centre for Human Rights Education, from 2006-2012. Professor Sheppard was elected a Fellow of the Royal Society of Canada's Academy of Social Sciences in September 2016. Constitutional Law, Human Rights (especially equality rights), Feminist Legal Theory, Economic and Social Rights and Anti-discrimination in the workplace. Inclusive Equality: The Relational Dimensions Of Systemic Discrimination In Canada (McGill-Queen’s University Press, 2010). Link. Institutional Inequality and the Dynamics of Courage (2013) 31(2) Windsor Yearbook of Access to Justice 103. Link. Inclusion, Voice and Process-based Constitutionalism (2013) Osgoode Hall L.J. 547. Link. Sheppard, C. (2012) 151 International Labour Review 1-19. Sheppard, C. (2010), Working Paper, CRISE (Centre for Research on Inequality, Human Security and Ethnicity), Oxford University; published online, February 2010. LIEN . Sheppard, C. (2008) 2 Journal of Parliamentary and Political Law (Part 1) 99. Sheppard, C. (2008), 41 Supreme Court L.R. (2d) 83; also published in Jamie Cameron ed. Reflections on the Legacy of Justice Bertha Wilson (Toronto: Lexis-Nexis, 2008-2009) 83-101. Sheppard, C. (2006), 30 Vermont Law Review 463. Sheppard, C. (2004), 24 Supreme Court Law Review (2d) 1. Sheppard, C. (2004) 16 N.J.C.L. 101. Sheppard, C. and S. Westphal. (2000) 15 Wisconsin Women’s Law Journal 335. Sheppard, C. (2000) 26 Queen’s Law Journal 1. Sheppard, C. (1998) 15 Arizona Journal of International & Comparative Law 143. Sheppard, C. (1995) 3 Canadian Labour and Employment Law Journal 249. Sheppard, C. (1995) 12 Canadian Journal of Family Law 283. Sheppard, C. and S. Westphal (1992) 5 Canadian Journal of Women and the Law 5. Sheppard, C. and D.J. Jones (1989) 12 Dalhousie L. J. 103.
in Errol P. Mendes & Sakunthala Srighanthan, eds. Confronting Discrimination and Inequality in China (Ottawa: University of Ottawa Press, 2009) 232-243.
in Les 15 ans du Tribunal des droits de la personne et les 30 ans de la Charte des droits et libertés de la personne (Cowansville: Yvon Blais, 2005) 379-406.
in Droit à l’égalité et discrimination: aspects nouveaux (Cowansville, Québec: Éditions Y. Blais, 2002) 139-154.
in N. Kasirer & R. MacDonald, eds., Mélanges Paul-André Crépeau , (Cowansville: Yvon Blais, 1997) 641-678. Sheppard, C. Working Paper, Prepared for the Equality at Work: Concepts and Policy Responses in a Changing World, International Labour Organization, Technical Meeting of Country Experts, Geneva (June 2002). Sheppard, C. Study Paper, Ontario Law Reform Commission, 1993 (cited favourably by the Supreme Court of Canada in Lovelace v. Ontario,  1 S.C.R. 950). 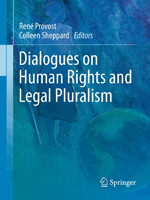 "This book project explores the potential for legal pluralism to bring innovative perspectives to our understanding of access to human rights justice. It offers important insights into the obstacles to effective enforcement of state-based human rights protections that are embedded in the informal law of social institutions and communities..."